Our childbirth educator worked hard during our classes to unite us as a couple. She wanted to help us build strength in preparing for our new addition, so that we would remain strong after. She repeatedly read off statistics about how 1/3 of couples report being less happy after the birth of a baby, 1/3 of couples report feeling the same, and 1/3 report being happier. She wanted us to be that happier third. She wanted a new baby to be a healthy addition to an already healthy marriage. Just after JaiseAnn was born, Zach whispered into my ear, "I didn't know I could be this happy!" That paired with seeing how much Zach loved JaiseAnn made me feel like, "Yes! We'll be the third that's happier! We're on our way! We're practically there!" Yes, I really did think those things. And then real life with a baby set in and I realized that even though we all loved each other so much more than I knew possible, things felt different. Anytime there is a change in dynamics in a relationship, it's an adjustment. Children create a major change in dynamics. Especially babies. Having JaiseAnn affected me physically--from the recovery, to the weight gain, to the lack of sleep, nursing, emotionally, and even spiritually. Becoming a mother--becoming parents--has definitely changed out marriage. The changes to my marriage haven't been "bad." I would not say that, but I would say that some changes have been awesome and some have been really difficult to adjust to. But like we always have, Zach and I keep pushing through until we find a place where we are happy--and then another change comes along and we start all over. The love and joy in our home has exponentially increased and it continues to do so. We laugh and smile and say "I love you" in our home a whole lot. Our house is bursting with love. We are so enamoured with our little girl and the chance to experience life through her eyes. There's just something really special about sharing our love for her. When we're watching her play or laughing at her squeals or telling her how cute she is--I look at Zach and I just know. I know that he is the only person that feels like I do about her. He's the only one that shares that kind of love. And I know he always will and that makes me feel that our family is safe and happy. From the moment I met Zach I knew that he had a softer heart than he let on. I was privileged enough to see that softer side almost right away, but it gets even softer than I ever knew now that he's a dad. JaiseAnn can bring him to tears in a matter of seconds. He's so in love with her, he's goofy with her, he rushes to comfort her, and all of those things just make me swoon. I can't believe we're parents sometimes and sometimes I just have to tell JaiseAnn that she's so lucky to have her dad--their relationship is going to be special and I love that more than I could ever say. Zach and I have always worked opposite schedules. We have always done things our own way and now we have a whole shift. We need to work together to get everything done in a day from making the bed to grocery shopping to cleaning up dinner. We've had to really start communicating about what needs to be done and what we need as individuals. It's really made us focus on what the other person needs and how we can help. We were partners before, but this partnership is different and (hopefully) becoming stronger and more solid. *An added bonus--when you see what Zach's seen--from the delivery room, to my high anxiety hospital stay, to my long road to recovery at home. Not to mention the breastfeeding, the weight gain, the breast pump--he's seen it all. I didn't want that. I always had hoped to keep some things private to "keep the mystery alive." It turns out that you really don't care all that much about mystery and romance when you are recovering from childbirth. And I've learned, that it isn't quite so bad. In fact, it has made me feel closer to Zach and improved our intimacy--emotionally and physically. I never thought I'd say that after having a baby, but it's the truth. This is probably the area that I've struggled the most in..and boy have I ever struggled. When we talked about having a baby I always wanted to be sure that Zach planned to help--he'd help in the middle of the night, change diapers, and let me sleep in in the morning. He'd help with bath time, and dinner, and play with our baby. People warned me that it wouldn't happen like I thought it would. They warned me he'd sleep and he'd take a backseat and I remember being adamant as I said, 'No! Zach's different. We've already got plans for sharing the load. He's going to let me sleep and he's going to help out. He's more excited than I am." I guess I didn't believe them because a). People told me marriage was hard and I really hadn't felt that it was all that difficult...so here was yet another warning--people trying to rain on my parade. and b). Zach was different. I truly truly believed that. But then JaiseAnn was born and Zach crashed HARD that night and slept until 10 the next morning. Yes, he was up for over 24 hours but so was I and I HAD A BABY!! I went the entire day waiting to be released from the hospital. We weren't released until 8 p.m. and when we got home I FINALLY got some sleep--aside from waking constantly to check on JaiseAnn and feed her. And Zach slept in AGAIN. This cycle repeated for longer than I even care to share. Long enough that I was truly angry and upset and praying for guidance in how to approach this. It seemed so unfair. It seemed so unequal. It seemed so selfish. I have had to really communicate with Zach about what I need and how he can help. Ultimately, Zach wasn't trying to be selfish, but he felt like I would speak up and let him know what I needed. If I needed to sleep, I would tell him I needed him to watch JaiseAnn so I could. I was waiting to be dotted on and have him tell me, "You're amazing and you just gave birth...and you keep going and going and going, go lay down. I'll watch her." Seriously, I have my expectations playing out like movies in my mind and when it doesn't happen the way that I think it should happen, it's hard. I need to let Zach know what I need. If he refuses to help, then we have a problem. I've had to articulate things that I really never felt I needed to articulate (I thought it was pretty obvious I needed some sleep). And while I don't feel it's perfect, we're getting there. The fact is, though, in our home parenting will never be equal. I'm the mom and that's just different here--at least with JaiseAnn. She's a mama's girl and she exclusively breastfeeds so Zach is limited in how he can help already. I have to be very clear about what I need or want and sometimes that can be frustrating, but I'm learning to deal. With me not working, we're home together more, but we have less time together. This has also been a hard adjustment. Sometimes I just want to curl up for the evening with Zach but JaiseAnn wakes up often, or I'm tired, or we didn't get finished with dinner until 9 p.m. Our alone time is very limited and that's why we've made an effort to spend our time together more intentionally. Throughout the week, we watch a show or a movie on the couch (putting electronic devices away) and occasionally we'll play a card game. Once a week, though, we do plan an "at home" date for the two of us. We've gotten better at coming up with activities. As we adjust to this new approach to time together, I think we'll find that it's the new normal and it will be just fine. We're not lacking for time together, just getting used to the situation. There are so many aspects to the financial situation. Our finances changed drastically when I decided not to return to work. In order to make up some of the difference I found a little bit of work from home (that I do when JaiseAnn naps) and Zach took on extra hours at work. This limited our time together even more and it put different kinds of stress on Zach and I. Zach became the main provider which must be a heavy weight to carry--especially when his job wasn't what he wanted it to be. I felt guilty at times for not returning to work and other times I felt worried that I'd have to go back to work (sometimes I still worry that I'll have to go back, but I pray daily that I'm never forced back to work). This stress can make the time that we do have together tense and hard--we both struggle, but very differently and it's completely new territory for both of us. Ultimately, our goal to work hard to get out of debt is helping us buffer the financial stresses. We have a specific plan in mind to snowball our debt and we are starting SMALL...very small, but we're starting and we both know that it will get better. Zach continues to work hard in his field and hopes to continue earning more money and I hope to help us stick to a budget and live well within our means. We work on this together and it helps make things less tense and more productive or hopeful. 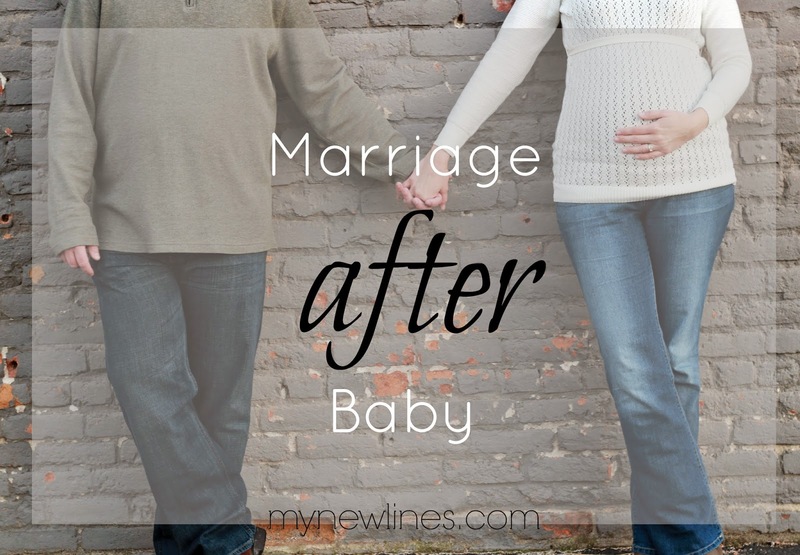 Have you experienced any of these changes in your marriage after a baby?